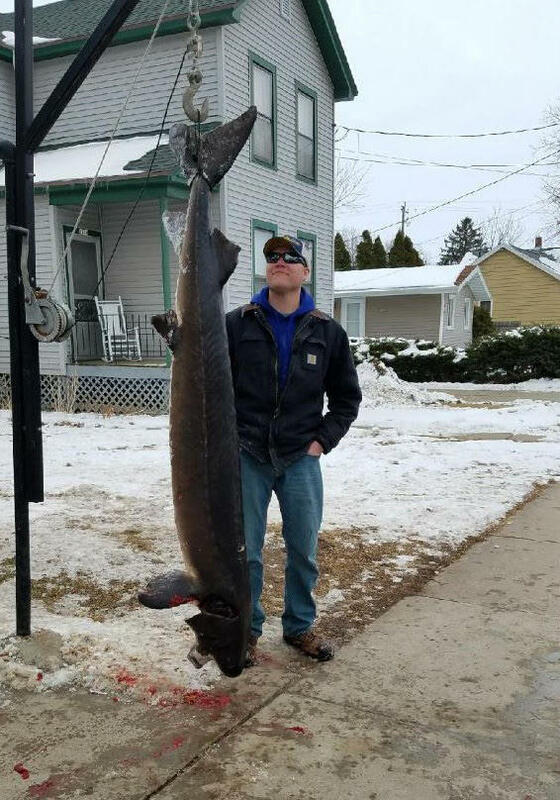 MADISON - The deadline to purchase licenses for the 2019 Lake Winnebago sturgeon spearing season is Oct. 31, with state biologists forecasting great opportunities to land the fish of a lifetime. "The fish population is strong - we've got more fish than we've had in decades and plenty of big fish," says Ryan Koenigs, Department of Natural Resources Lake Winnebago sturgeon biologist. "As always, the biggest driver of spearing success will be water clarity, and we won't have an idea what clarity will look like until the weeks leading up to the season." The 2019 spearing season opens Feb. 9, 2019, with separate but simultaneous seasons for Lake Winnebago and for the Upriver Lakes. Participation in the Upriver Lakes season is determined by lottery. The seasons run for 16 days or until harvest caps are reached; system-wide harvest caps for 2019 are 430 juvenile females, 950 adult females, and 1,200 males. A mid-winter warmup before the 2018 spearing season resulted in reduced water clarity and contributed to a lower harvest: a combined total of 951 sturgeon. That total is down from averages over the last decade, but still the largest recreational spear harvest for sturgeon in the world and an increase over the 2016 season total of 703 fish, and 2017 total of 847 fish, Koenigs says. Licenses are again $20 for residents and $65 for nonresidents and can be purchased by visiting GoWild.Wi.gov or any license sales location. To find a license agent near you, go to dnr.wi.gov and search with key words "license agent." The minimum spearing age is 12 years, and youth who turn 12 between Nov. 1, 2018, and the last day of the 2019 spearing season can still buy a spearing license after Oct. 31. Military personnel home on leave can also purchase a license after Oct. 31. There are unlimited license sales on Lake Winnebago, while the Upriver Lakes fishery is managed by a lottery and limited to 500 permitted spearers. Once a person is authorized to buy an Upriver Lakes license for a season, they are not able to buy a license for Lake Winnebago. Spearers are now able to transfer Upriver Lakes spear licenses to youth spearers (age 12-17) and can do so by filling a transfer of license form at least 15 days before the 2018 sturgeon spear fishery. Spearers who applied for an Upriver Lakes license in the lottery but were not drawn for a license receive a preference point and can still purchase a Lake Winnebago license before the Oct. 31 deadline. For more information on harvest trends and management of the Lake Winnebago sturgeon fishery, visit dnr.wi.gov and search "Lake Winnebago sturgeon spearing." Open house runs 8 a.m.-3 p.m.; "Indigenous Perspectives on Lake Sturgeon" set for 4 p.m.
WILD ROSE - Families and fish enthusiasts of all ages will want to visit Wild Rose Fish Hatchery one last time on Oct. 27 for an open house, fun fishing-related activities, and a presentation by a Menominee tribal elder on "Indigenous Perspectives on Lake Sturgeon." "Our open house ends up being a nice family day," says Jesse Landwehr, Wild Rose supervisor. "Visitors get a good chance to see what we do and why we do it, and it helps get everybody outdoors more." 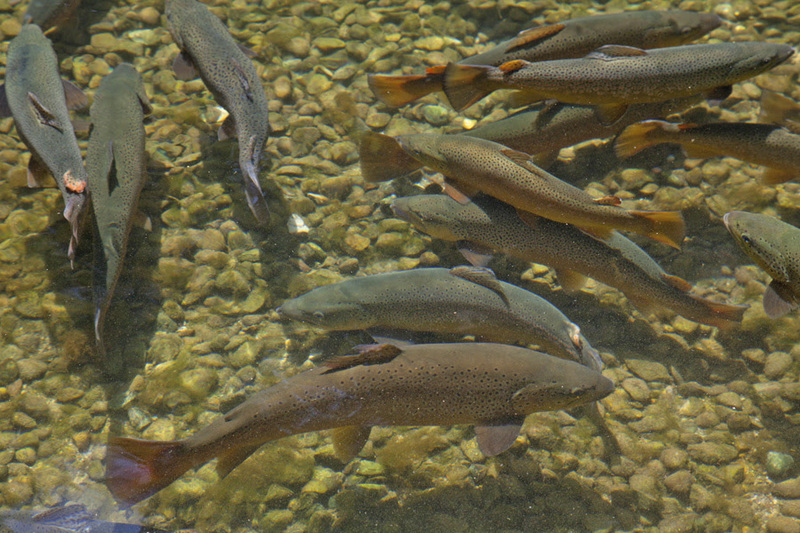 The hatchery in Waushara County is the workhorse of the state's fish hatchery system, producing more fish and more diverse species than any other, and it features beautiful, century-old historic hatchery grounds where people can see Lake Michigan fish up close. The open house runs from 8 a.m. to 3 p.m. It is free and open to the public, and is the last big opportunity to visit the hatchery before it closes to visitors in November through March. The hatchery is located at N5871 State Road 22, in Wild Rose, Wis., and during the open house, visitors can enjoy exhibits and aquaria in the education center, including a new exhibit on lake sturgeon. They can join in fish printing, fly tying and casting and other fun activities at the center, and then stroll the historic hatchery grounds and see big brown trout up close in the show pond and raceways. Visitors also can see what modern fish rearing techniques and equipment look like through a viewing window into Wild Rose's coldwater facility up the hill. Here, hatchery crews are raising 800,000 chinook salmon and 400,000 each of brown trout and coho salmon for stocking into Lake Michigan. Wild Rose also operates a "coolwater" facility where crews raise lake sturgeon, muskies, northern pike, Great Lakes spotted musky, and walleye; those facilities are not open to the public. At 4 p.m. in the education center, visitors can join Mike Hoffman for stories and conversation about "Indigenous Perspectives on Lake Sturgeon." Mr. Hoffman is an Elder who is a descendant of the Menominee and Ottawa tribes. He is a fluent speaker of the Menominee language and serves as Cultural Consultant to the Menominee Clans Exhibit at the University of Wisconsin - Stevens Point Museum of Natural History. The presentation is the last in a series on lake sturgeon sponsored by the Wisconsin Humanities Council, one of the sponsors of the new sturgeon display, along with Sturgeon for Tomorrow, the DNR and Sport Fish Restoration dollars.